Hello Frndzzz.... www.dealsnloot.com Again Back With New FreeCharge Loot Offer. Freecharge offering Prepaid Mobile Recharge, get Rs.50 cashback on Rs.50 recharge. It works only for new users.Not valid for Airtel Users. Valid on all successful recharges/bill payments till next 7 days. Valid only for new users on FreeCharge (App/Website/MSite). Valid maximum 1 time per user/credit/debit card. 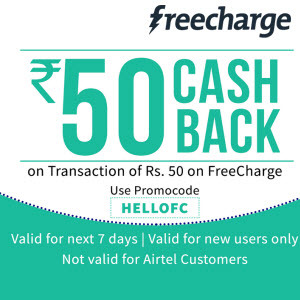 Not valid for Airtel customers & transactions done via FreeCharge Balance & NetBanking. Cashback to offered in the form of EGV which can be redeemed in next 6 months from date of credit.